I step out the door, bracing against the cold seep of snow melting through my boots. Overhead, the sky, spring-blue and shot through with birdsong. This is one of those precious liminal spaces, those danger-zones of heart and spirit, the slim slice between seasons where you step out your door and anything, anything, might happen. Shiloh tugs at the leash, a taut-muscled kite lusting for the wide expanse of sky and snow. I hold firm, and before us, chickens scatter. We slip-slide down the little dip to the driveway and onto the path that runs along the fenceline. 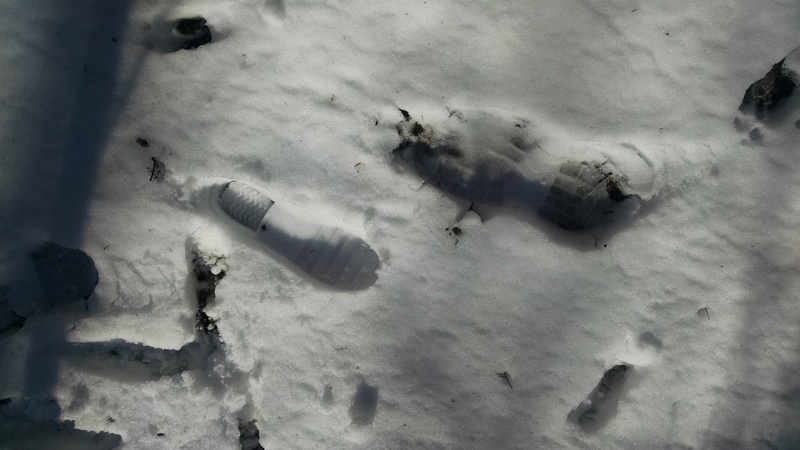 I unclip the leash and she shoots away, dimpling the white slush with padded prints. Ahead of me she bounds and the path stretches into the woods, disappearing between trunks of leafless trees. The snowmelt chill oozes through my socks and I force my toes to uncurl, to welcome it. 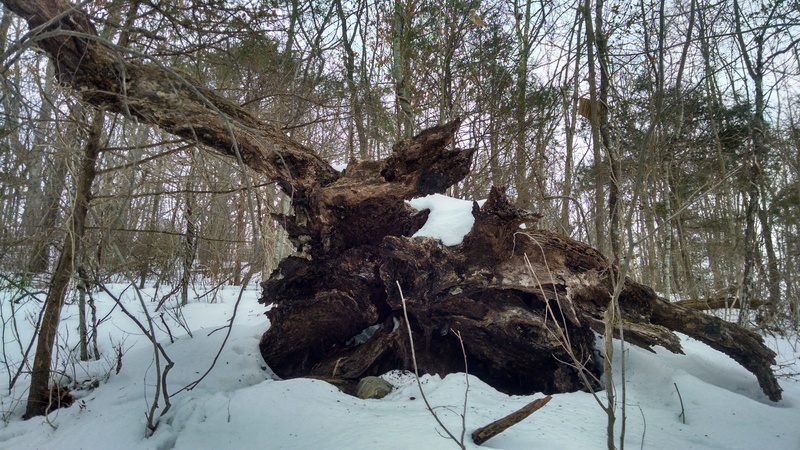 We have lain so long hibernating in the woodstove heat, mummifying in the dry air, and my roots are thirsty for thaw and the thick rich mud beneath the thin exoskeleton of ice that crunches underfoot, a sugar-coating over the surface of the world. The entire world is snow-covered–how can it be otherwise? A little Ice Age has come and swallowed us all, clamping the birds’ mouths shut against anything but kernels of warmth. Palm trees, sun-warmed sand, butterflies–these things are impossible, myth only, pretty stories with which to prick our spirits to a little life by the fire at night as we lie dessicating in the sterile heat. But today–oh, today! I meet my husband’s footprints coming toward me, Shiloh’s day-old tracks, the ghost-prints of a dead day. Footprints of deer lace between them, their cloven hearts pressed through snow into soil that slowly leaches up, staining the white. This is the place–tangle of fence and briar on one side, swift sweep of pine-dotted hill to the other– where sometimes we catch morning’s minion, the red-tailed hawk who lances into the blue impossible with a sweet painful unfurling of wings. When he springs up, my heart catches on one sharp talon and I am tugged toward the infinite. This morning, though, he’s not here–but then blackbirds explode from the withered branches and print their feathers stark against the sky, song bursting from their throats. This morning, the woods are in motion, kissed to life by the fingers of sunlight that slip through. Birds chatter, snow melts, and the wind has put away its knives. In the woods, blue shadows linger, cupped in hollows. The cold steals softly over me, gentle but insistent. The season still has teeth. I wonder how Western civilization came to an understanding of black as the color of death when it is this hollow still blue that obliterates everything, that wraps tendrils around the heart’s warmth and murmurs of oblivion, of silent subterranean seas. Through the woods, up the winding path, past the place where a great tree fell years ago and lies slowly sifting back into the soil, its roots pointing toward the sky. This place holds magic that both girls and dogs can feel. It has pulled us both, Shiloh and me, at one time or another, to nose around it, peer into the little cavern where it tore from the soil long ago. Then sharp up the hill, past the mound where Mr. Fairburn heaped stones from his fields before I was born. Another magical place, a burial mound with no body, a collection of smooth rocks marking–what? Surely something? Why did the old farmer choose this spot out of five hundred acres to pile his stones? 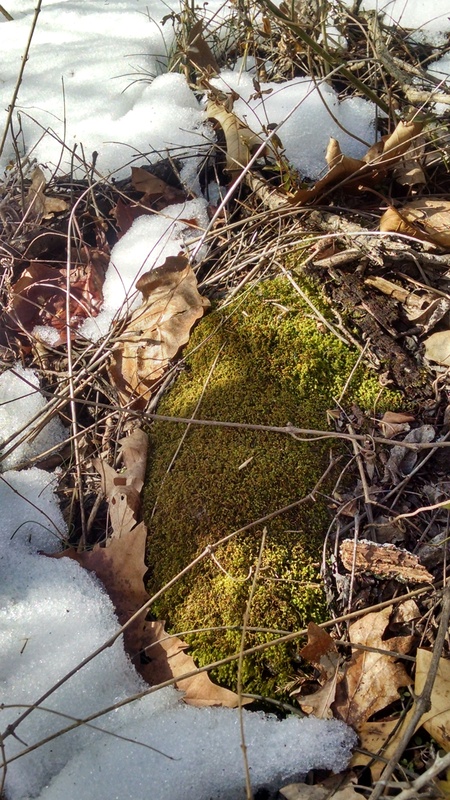 The mound is a mystery in any season, but now, with scraps of snow clinging to its flanks, some primordial god or goddess disgorged by the earth, it is most mysterious of all, for it is emerging. Along the way I read tracks, in my half-literate way. 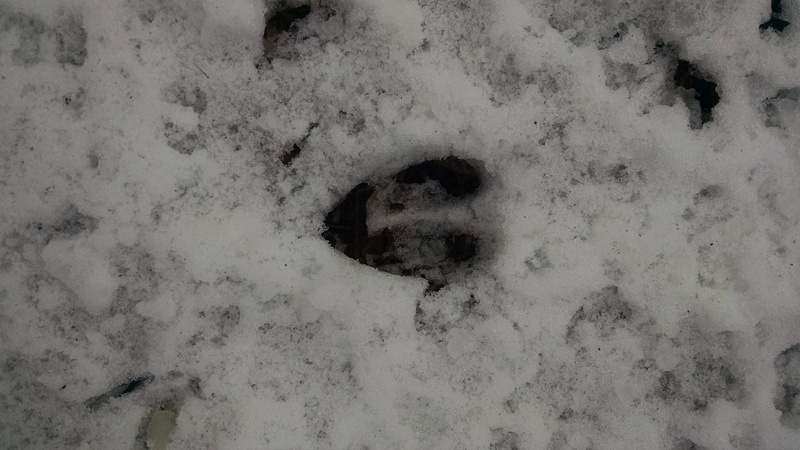 The wild turkey hasn’t been back, but the deer are everywhere, and some clever-toed little clawed thing has pressed its story into the snow–raccoon, I think, from the nimble splayed fingers of it. A rabbit, four prints all tucked close, is a grounded thing, a creature of earth if there ever was one. Its prints are soft and rounded like its body. A deer’s hint at flight, hearts trailing thin brushstrokes where sharp-pointed hooves graze the snow. At the top of the hill, in the woods, all our old tracks have been obliterated. Shiloh springs forward and I watch her run. Her flight carries me along with her, and for a moment I am low-slung, weaving through bramble and briar, and I exult in her speed. But finally this vicarious motion is not enough, and I stretch my stride, run down the hill through the gap in the fenceline. We hurry so much, we grown-ups, but don’t run enough, or for the right reasons. We do not stop running until we are through the gate, not looking at the place where the grey fox died last year, and has lain, freezing and half-thawing and freezing in the snow. It has been so cold that the body lies intact but for the single stab from a disenchanted buzzard who took one bite and never came back. But for that one posthumous wound, the animal could be sleeping. 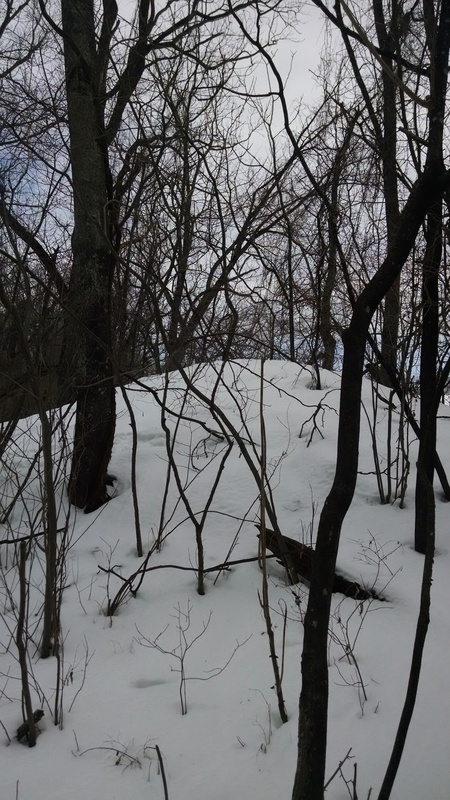 Sometimes, on snowless days, I walk over to the body, watch it for a moment, half expecting the rise and fall of sudden breathing. It is so lifelike in death, this small and beautiful corpse. But today, the fox sleeps its forever-sleep beneath a frozen comforter, and we pass by. Then around the west side of the field, where groundhog-holes yawn soft in the snow, their inhabitants deep-sleeping still. Robert Frost and Emily Dickinson strike up a conversation in my head as Shiloh flies the path before me. We crest the next hill, where the wild persimmon tree hangs its withered fruit high above our heads still, little Tuts dangling over us, dark and wrinkled reminders against the bright singing air. A wren chirpity chirpity chirpity chirps as I look down on my neighbor’s white-capped house below, and I remember that it is Sunday. In the dim light beneath the cedars, the world has ended in ice, the flood has come but it is a frozen deluge, and yet it is melting, sun and wind are carving out the tiny shadows of the last standing grasses and blackberry canes, and above the branches the air is limned with bright blue fire. We track back down and up the final hill and glory, glory, glory, the earth is full of it and the bright curve of the sky overhead is all we know of heaven. Our brown house nestles down snug and warm against the hilltop, and we are back from the wild wood and safe in the Shire, the sun streaming down with abandon and the promise that even Ice Ages end. This is the most beautiful!!!! Also I *heart* Gerard Manley Hopkins . . . Thank you, darling Heidi. Gerard Manley is indeed a rare and wondrous bird. “the wind has put away its knives” – gorgeous and made me stop to savor it, and then stop again to comment here. Perfect.